Natural Ability evolved from the many requests Brian Butler - a seasoned athlete and widely respected club coach - received for triathlon-specific personal coaching. Combining his knowledge and skills as a Level 3 BTF Coach with his own competition experience in swimming and triathlon at all distances and up to GB Age Group level. 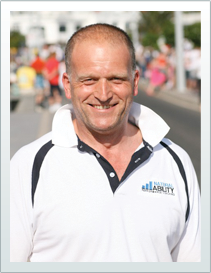 Brian and his team deliver athlete centred coaching programmes to empower others to achieve their own sporting goals. Brian Butler has been involved in triathlon for over 24 years. Competing at all distances and racing for the Great Britain Age Group Squad at Standard Distance, Brian now concentrates on the longer distance races with one of his favourite races being Lanzarote Ironman. Brian who has been coaching for over 24 years and wh has previously working for the BTF as a Coach Tutor/Assessor and Internal Verifier, is in the process of completing a brand new BTF coaching qualification 'The Kazen' designed for experienced Level 3 coaches. Brian believes that everyone has natural ability it's just finding the key to unlocking 'your own potential'.